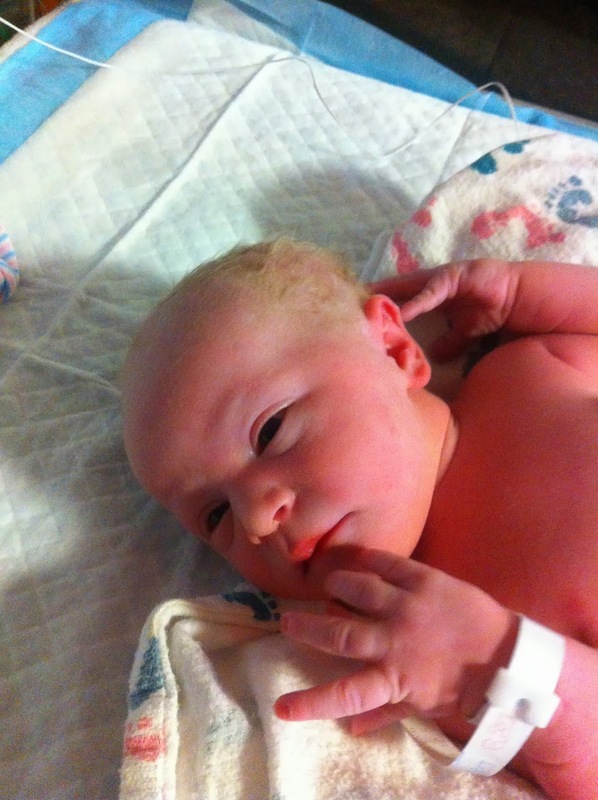 On Tuesday, February 25, 2014, at 3 in the afternoon, my first-ever grandchild, Kataleya Lee Wahl, entered the world via cesarean delivery (she was breech), weighing 7 lbs. 1 oz. and measuring 20 inches. As you can see, she's beautiful. Her mother, Ashley, is doing well, so much better than I was doing the day after I gave birth to the baby who grew up to be her husband and Kat's father. That baby, my older son, Christopher, was the one who cut the umbilical cord and first held his daughter in his arms. Boy, it's hard not to cry as I type those words! Christopher and Ashley both live with me, and that means that come this weekend, Kataleya will live with us, too, in our very small house. As I greeted Kat on Tuesday, I noticed not only how beautiful and perfect she is, but how helpless you feel when a little baby cries, how desperately you want to do anything to make her feel better, and how sometimes you . . . can't. I'm actually writing a book right now about a girl - Nora, the girl with the ant farm - who in the second book of the series becomes a ten-year-old aunt. I've been writing about the disruptions this brings to her family, and how much Nora dislikes disruptions. I wondered if I might be exaggerating a bit. But when I held my crying granddaughter and tried to soothe her with a lullaby (a doomed plan, as all she wanted to do was to have her first go at nursing, which happened a few minutes later), I realized I hadn't exaggerated at all. Babies are disruptive. Period. They disturb the universe when they make their entrance into it. Now, I'm a lot like Nora, except that while she's focused on her ant farm, I'm focused on writing books about her and her ant farm. I love order, both in terms of my living space (I'm a near-fanatic neatnik) and in terms of how I structure my time (all those to-do lists!). What am I going to do now, as I try to keep my own projects marching merrily along (my busy teaching job, FOUR books that need to be completed by the summer, lots of travel, and more)? I'm going to have to make some changes. But you know what? Those changes are NOTHING compared to the changes little Kataleya made on the day of her birth. She, too, liked things just the way they were, safe and snug inside of Ashley, getting all her nourishment, everything needed for life itself, from her mother's support system. Ashley could have tried having Kat turned from her breech position to avoid the surgical birth, but it seemed to her too violent to do it, to make this contented little person give up the cozy position she had created for herself. Then on Tuesday afternoon a team of doctors and nurses plucked Kat out of that cozy safe, snug spot and wrenched her into LIFE: to the blooming, buzzing confusion that is the world. On her very first day she had to figure out how to breathe, to suckle, to poop. So how can I worry about how to make space in my cozy safe, snug life for a new grandchild to love? It will all work out. Things always do work out, especially where is so much love and good will. I worked hard all during February to clear as much of my calendar as I could for "grandmother leave." I didn't have to clear out a huge place in my heart for her; she has that already. Plus, hearts have a way of expanding as new opportunities for love arise. If Kataleya can change, I can change. She's already changing every day. I just turned down an opportunity to spend a year doing something I love in a place I love with people I love (and receiving an extravagantly generous salary for doing it). Why on earth would anybody turn down an offer like that? Because there is something I love doing (also in a place I love and with people I love, though without the extravagantly generous salary) that matters to me even more. This is a year of transitions for me, huge, life-changing transitions. In six months I have a milestone birthday. In scarcely more than three months I retire from my twenty-year career as a professor of philosophy at the University of Colorado. In less than a WEEK I welcome into the world my first grandchild. As I launch what I'm calling Act III of my life, I have a clear vision of what I want that life to be, distilled from sixty years of hard-won wisdom. If I'm going to make that vision a reality, I can no longer afford to be distracted by other glorious possibilities, tempting as they are. The fierce huntress Atalanta refused to marry; pressured by her father to accept a mate, she vowed she would wed only a man who could beat her in a footrace or die in the attempt. Many suitors perished until one sought the assistance of Aphrodite, goddess of love, who gave him three golden apples to scatter along the way. Distracted by their irresistible gleam, Atalanta darted after them, slowed her speed, and lost the race. Back when I lived in Maryland, half a lifetime ago, a therapist/life coach warned me against my tendency to dart after golden apples rather than keeping my eyes on the prize of what I love and value most. I didn't listen. And I have to say I've loved my scramble after all of those golden apples. I don't regret a minute of it. Plus, the golden apples glisten attractively on my shelf. But Act III is the time to make sure that your story is heading in the direction you really, truly, most deeply want it to go. Even if this means that a golden apple or two or three rolls away to be collected by someone else. I have enough golden apples now. It's time for me to make sure that Act III is heading where I want it to go. This spring I'm serving as a paid mentor to a four-member Boulder children's book writing group. They invited me to join them for their monthly meetings to offer my insights into their works-in-progress. Each month, from February to May, one member will submit a completed book-length manuscript to the rest of us for critique. Then we meet over dinner to discuss it. I was flattered to be asked to share whatever expertise I've accumulated in my thirty-year, fifty-book writing career. I adore mentoring anybody who wants to be mentored: students, fellow writers, those seeking life advice (the latter, my specialty!). As I transition away from my university career to a life as a full-time writer, income is going to be a significant concern. So how lovely to be able to make some extra money by doing something I love. I spent all day yesterday reading the February manuscript and making detailed notes. I congratulated myself on the brilliance of these notes. Was I good, or was I GOOD? Then I went to the meeting. I heard everyone else's comments. And I was blown away by the brilliance of everyone else in the group. My brilliant comments were just so-so on the collective brilliance scale. This group totally ROCKS it in the critique department. I came home afterward and wailed to my husband, "Everyone else's comments were so much smarter than mine!" And he said, "You're always so competitive." So then I had to think for a while not only about being a not-so-brilliant critquer but about whether I was an unattractively competitive person. And then, because I always have to find a way to come up with a story to make myself feel not-terrible about who I am, this is what I told myself. I don't think I'm a competitive person. Of course, I want recognition for my work. Almost everyone does. But most of all, what I want is to feel that I'm making a contribution in the world. This group paid me to come last night. I want to feel that they got good value for their money. I want to feel that I contributed something extra to their gathering to justify their having invited me. I want to feel I earned my keep. I feel this at the philosophy department, too. When I marvel at the dazzling intellect of most of my colleagues and feel bad about myself accordingly, I don't think this is because I'm competitive; it's because I want to feel that I deserve to be there, too, that I'm not a fake and a fraud (which just about every academic thinks himself, or even more so, herself, to be). I want to be able to cash my paycheck without shame. That's the first thing I told myself. The second thing is that different people contribute in different ways. At the philosophy department, I finally accepted that while I was never going to equal some of my most amazing colleagues in their world-class research, the articles I published were not without their own quirky charm. I could pride myself on the fact that if the thesis I argued for was sometimes, in fact, false, it was never uninteresting. I'm a good teacher, particularly of first-year students. And I've been an outstanding mentor to graduate students, especially ones who battle the same demons of self-doubt that I do. Last night I contributed just by being a different voice. Even if what I said was mainly in confirmation of the wonderful points already being made, that kind of confirmation is valuable, too, coming from someone who has a long career behind her. As we talked, I thought of new things to say that I hadn't thought of on my own, but that always happens whenever I'm in a critique group. It's a highly interactive process. The author of the night ended up getting an excellent critique from all of us together, and I did contribute. I wasn't the star of the evening, but I wasn't supposed to be. I was supposed to be a smart, thoughtful writer who had read the manuscript carefully and thought about it deeply, talking about it with other smart, thoughtful, careful, deep-thinking writers. I was. All of us were. My goal is not to be the best, but to do my part. Then it's up to others, really, to decide whether or not I did. I've finished four weeks of my final semester of teaching at CU, with eleven weeks to go. This is a stressful semester in a number of ways. In addition to my usual two courses for the philosophy department, I'm also teaching a delicious one-credit course on fairy tales for the Norlin Scholars honors program, so that adds to my teaching preparation and grading. With an eye toward the transition to my new career as a full-time children's book writer, I scurried about to get some book contracts lined up, but the deadlines turned out to be sooner than I planned. So I have two 25,000-word children's book manuscripts due by June. The full manuscript of my edited collection on ethics and children's literature is also due to the publisher by the end of March. In addition, this semester I have four trips: to Chicago for the Central APA, to San Diego for the Pacific APA, to Warrensburg, Missouri, for the huge children's literature festival hosted each year by the University of Central Missouri, and a week of school visits in Michigan, which will take up the entirety of spring break. Oh, and I also have my first-ever grandchild coming the end of this month; my son and his wife are living with me, so there will be a new little human being living with me, too, in a little more than two weeks. So I told myself: okay, this semester will be stressful and demanding (though also full of wonderful things like writing, which I adore, and trips, which should be tons of fun, and a granddaughter, which all my grandparent friends assure me is one of the sweetest things that life can offer). I'm not really counting down the weeks of the semester because I don't want to count my life away. Okay, I am counting down the weeks. But mainly I'm counting them down to reassure myself that so far it hasn't been bad at all. With four weeks behind me, I've gotten work done on both the edited collection and the second Nora Notebooks title and written the comments I'm giving at the Central APA the end of this month in Chicago. I've done a lot of reading for pleasure. I've had get-togethers with friends. I've slept for eight hours every night. I've been watching the Olympics. The only thing I haven't done is exercise and eat healthfully. (Oh, well.). So if at this point the semester turns hideously stressful and demanding, there are now only eleven weeks left of possible stressfulness and demandingness, rather than the full fifteen weeks of possible stressfulness and demandingness that I started with. Eleven weeks isn't so much. If I squint I can see the light at the end of an eleven-week-long tunnel. A friend of mine just lost her husband, tragically, unexpectedly, with no warning at all, while they were off together on a blissful sabbatical in Ireland. She posted on Facebook one of the last pictures she had taken before his untimely death, with the heartbreaking caption, "The last happy day." Those might be the four saddest words I've ever read. The only good thing I can think of to say right now is that it was clear from her previous email posts that she was treasuring the happiness of each happy day right up until that final happy day. She didn't know that the "last happy day" was going to be the LAST happy day (or at least the last happy day she would share on this earth with the man she loved: I hope and pray that she'll come to know other happy days again in her life ). But at least she knew it was a happy day. At least she recognized, appreciated, and celebrated the happiness that she had while she had it. Sometimes I'm afraid that I will have had the last happy day and failed to notice how happy it was. So let me announce right now: today is going to be a happy day, barring the terrible tragedy that can mar any human life, that indeed will mar just about every human life at some point. Already I can report that I got up early and worked on the comments I'm to deliver at the Central Division meeting of the American Philosophical Association, at the end of February in Chicago, on Tom Wartenberg's book A Sneetch Is a Sneetch and Other Philosophical Discoveries: Finding Wisdom in Children's Literature. I thought of some worthwhile and possibly witty things to say about the book. That felt good. Later this morning, I'm going to pick up my writer friend Cat and go to the cozy dining hall at Chautauqua and write with her by the fireplace. I'm going to order their hot chocolate that comes with the world's most perfectly toasted, golden-brown, marshmallow on the side. There I'll write what I hope will be a particularly droll chapter of the second book in my Nora Notebooks series. Afterward, I'll get Christopher and Ashley's report from their 10:00 doctor's appointment on how the last month of the pregnancy is going, the pregnancy that will culminate in the birth of my first granddaughter in a few more weeks. This evening I host my beloved writing group at my house. We'll read the last chapter of Phyllis's novel-in-progress, always a satisfying moment. We'll read a second draft of Annie's delightful work of creative nonfiction. I'll share a Nora scene. We'll eat leftover Superbowl party snacks. Oh, and throughout the day, snow is predicted to be softly falling. Fine flakes are sifting from the sky outside my window as I write this now. This is going to be a happy day. Please God, it won't be the last happy day. But I'm going to notice exactly how happy it is, either way.